Join us for our community hike! This fun ﬁlled 3 hour experience includes a tour of the ranch, an introduction to the pack and a hike through the Angeles National Forest with members of our pack, followed by snacks with the Wolf Connection® team. Community hikes have approximately 65 people in attendance and will be offered 4 times a year. Tickets are $65/adult, $55/child (age 7-16). Children must be 7 or older to attend. Interested in joining a small group experience? Join our 2.5 hour semi-private Walk with Wolves! Each experience includes a tour of the ranch, introduction to the pack, a chance to meet some of our animals and a relaxing nature walk. To learn more and see available dates, check out our Walk with Wolves Airbnb Experience page HERE. Ghosts above. Goblins below. Into the forest with wolves we go! Join us for our annual Howl’oween Hike with the pack! Complete with a hike, dinner and fang-tastically chilling ghost stories around the campfire. Mark your calendar now, this is an exclusive Wolf Connection® tradition not to be missed! Final date and registration for our Howl’oween event will be added to our calendar mid-summer. To sign up for upcoming hikes and community events, please check our Events Calendar. If you have additional questions regarding our community hikes, please check our Event FAQ’s page. Looking for something more personal? Try one of our private visits! Private visits are a great way to get more individual time with the pack and can be scheduled at your convenience. Minimum age is 7 years old. Our 2 hour private visit includes a tour of the ranch, introduction to the pack and a chance to interact one-on-one with some of our pack. Minimum cost is $800 for 1-4 people + $200 for 5th person and each additional person. Our 2.5 hour visit includes all of the above, as well as a nature walk with one or more members of the pack (approximately 0.5 miles) Minimum cost is $1000 for 1-4 people + $250 for 5th person and each additional person. 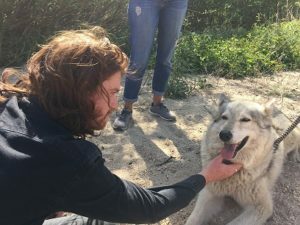 Our 3 hour visit includes all of the above, as well as a longer hike/walk with one or more members of the pack or more interaction time with the pack, depending on your preference. Hiking is one way in which wolves bond so a longer hike will give you a chance to connect with them on a deeper level, as well as see some gorgeous views in the surrounding area. Minimum cost is $1200 for 1-4 people + $300 for 5th person and each additional person. Please complete our Pre-visit Survey to schedule a private visit. Want to bring your class or club to the ranch for a day of learning and fun? In an effort to promote education and our mission to inspire the next generation, we offer school visits at a discounted rate. Looking for a new and innovative opportunity for team building or leadership training? Learn from one of the most effective teams in nature — the wolf pack. Explore the natural roles and dynamics of the pack, while discovering how these principles can be incorporated in to your organization. If you are interested in bringing a group of 10 or more, we offer the same private visit options but at a group rate. We can also cater visits to ﬁt your interests so please let us know your focus for the day. Some options include education, conservation, rescue efforts, animal care, pack roles, teamwork and pack leadership. Please complete our Pre-visit Survey to schedule a school, corporate, or group visit.